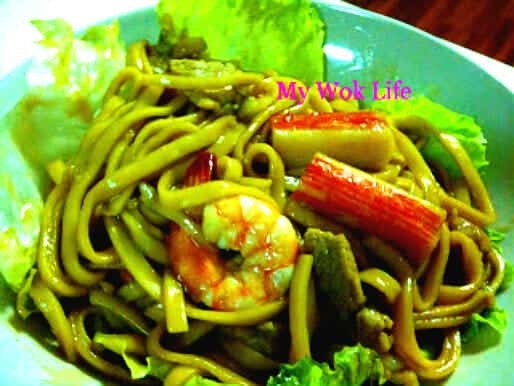 Stir-fried Hokkien noodles dish is cooked and presented differently in Singapore and Malaysia. Even choice of noodle used in the dish is different. For instances, Singapore uses flat strands and cooked with more watery and the gravy is less dark in colour, while Malaysia uses thick round strand resembling udon and usually cooked with loads of super dark colour thick soy sauce. I loved both styles, and am going to share the Singapore-style Hokkien Mee where you may easily have it in many “Zhi-Char store 煮炒摊” (food store selling Chinese cuisine in coffee shop/ hawker centre). I cooked this as my express dinner during weekday which took me less than 30 minute to serve. Noodle used in this Hokkien Mee is not the same as the strands used in cooking Stir-Fried Ee Fu Noodle dish as Hokkien noodle is slightly wider and lighter in colour. And, Hokkien noodles is not crisped or pre-fried like Ee Fu noodle, but sold in fresh yellow strands. No worries, Hokkien noodle pack is widely available in wet market and super markets. 1) Marinate pork slices with the listed marinating ingredient, for at least 15 minutes. 2) Heat oil in wok over medium heat, add garlic and stir-fry till fragrant. Add in pork and stir fry for 2 minutes. 3) Then, add Hokkien noodles (loosen the strands beforehand, if it’s all lumped together) and water (ideal water level should cover almost three quarter of the noodles). Redice heat to low fire, and simmer for 10 minutes, with lid on. Remove lid, and add dark sauce, salt and pepper, stir fry to mix well. 4) Add in Chinese cabbage and cover wok with lid again. Stir frying to mix well is not necesary at this stage. Just add the vegetable on top, and simmer for another 5 minutes, with lid on. 5) Afterwhich, remove lid. Add also the prawns and crab meat sticks. Stir fry the ingredients until cooked. Place a large leaf of lettuce on a serving dish. Laddle noodles on top of it. Serve immediately. Hokkien noodle dries up and turns soggy easily. So, serve and dig in immediately. 1 serving of my Hokkien noodle counts about 450kcal. 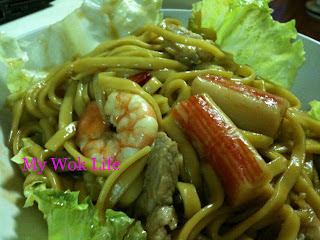 Tips: Fresh Hokkien noodle has this ‘alkaline water’ taste (碱水味), you may wish to blanch the noodle first before use. If so, please reduce the simmering time by half. However, I do not mind the mild pleasant alkaline water taste (this Hokkien noodle is supposed to taste like that..anyway~). So, I just rinsed the noodle briefly and used it straight without the need to blanch it beforehand.